Is RIM's management the cause of its failure? “Jim and Mike brought the company to where it is … which is part of the biggest problem they’re facing,” said Charter Equity analyst Ed Snyder, who has covered RIM since its public listing in 1997, two years before the BlackBerry was launched. “They’re stuck in the past. They know what worked and keep playing that card and it’s not working any more, and they don’t seem to have any ideas,” he said. via BAY STREET-As RIM struggles, talk of a change at top surfaces | Reuters. In the case of Apple, the departure of the founder is considered a grave threat to the continuing success of the company. In the case of RIM and Microsoft, the continued tenure of the founders is considered a grave threat to the success of the company. Clearly, the theory that founders of successful companies can assure continuing success is flawed. Coupled to that implied causality is that departure of founders is always a problem. Both are reflections of the idea that companies are predominantly successful (or fail) because of the skill (or incompetence) of a small group of individuals. What the idea fails to explain is why companies fail (or succeed) as a cohort. RIM’s troubles are similar to Microsoft and to Nokia’s. Did they conspire or collude to fail simultaneously? Historically, incumbents fail simultaneously, regardless of who’s in charge. And what about the problem that a company goes from success to failure (and vice-versa) while the same management is in charge. The “smart manager” theory of company success is as pervasive as the “stupid manager” theory of company failure. The perplexing thing is that while both of these theories are applied within the lifetime of a company, the management does not change. Microsoft is getting that money thanks to a patent settlement with HTC over intellectual property infringement. Microsoft is suing other Android phone makers, and it’s looking for $7.50 to $12.50 per device, says Pritchard. HTC Pays Microsoft $5 Per Android Phone, Says Citi. A rough estimate of the number of HTC Android devices shipped is 30 million. If HTC paid $5 per unit to Microsoft, that adds up to $150 million Android revenues for Microsoft. 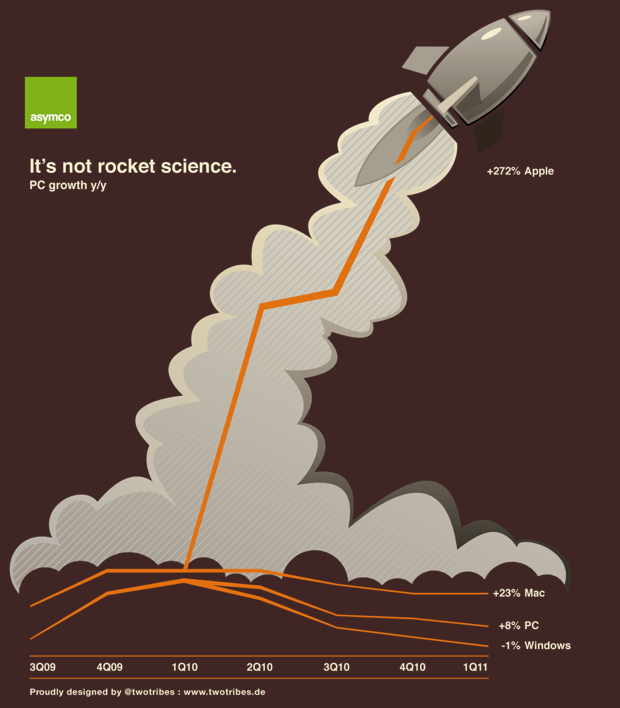 So Microsoft has received five times more income from Android than from Windows Phone. Looking forward and assuming that Microsoft can receive this type of settlement from about half of the Android license takers, then the prospects of a windfall from Android dwarf the expected income from Windows Phone. Google’s Android seems the best thing that could have happened to Microsoft’s mobile efforts, ever. I could also calculate how the Android license income could be further funneled to Nokia (via their current agreement with Microsoft) for promotion of its phones. Thus, an Android licensee could reduce his margins in order to promote a competitor’s products. 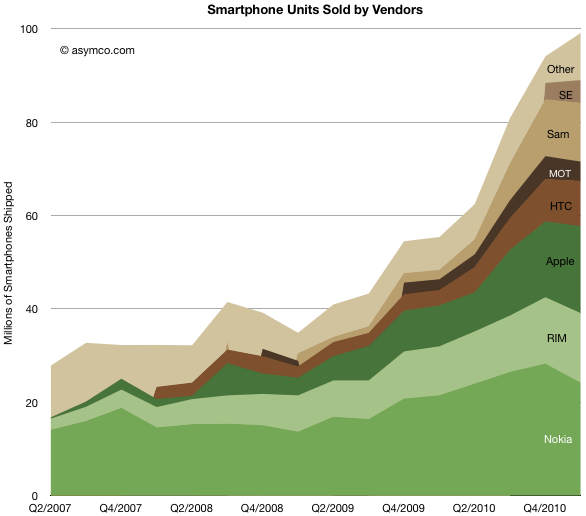 The phone market excluding smartphones is not growing. Over a three year period it grew at 2% compounded. The following chart show the make-up of the market by vendor. Since it is not expanding rapidly, share over time has a lot more meaning. 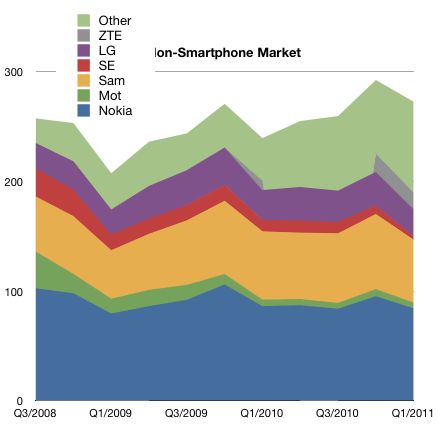 In the last post, I highlighted the difference between smartphones and non-smart device sales last quarter. The trajectory of share growth for smart devices would appear to have accelerated due to Android. The following charts show the evolution of smartphone vendors and platforms over the last few years. Like in the past, I used color clustering to show the separation between “integrated” (in green) and “modular” (in brown) platforms and their users. 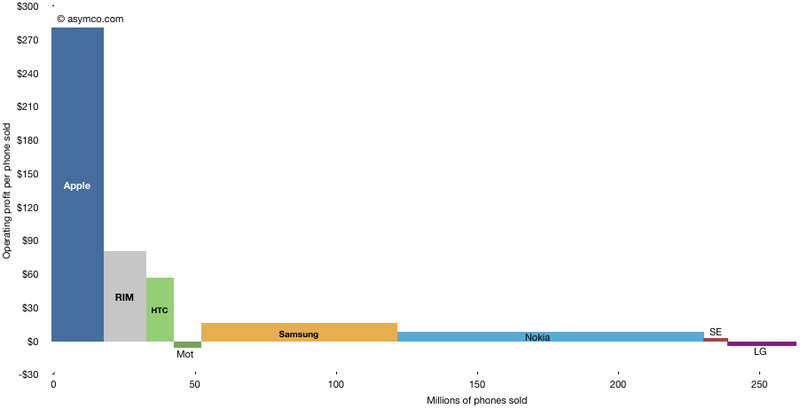 Unlike the non-smart market where “other” make up 30% of the market, smartphones are still a big brand business. “Other” make up only 11% of units. and that number has been trending down. It would seem that the age of unbranded Android phones is still not upon us. Smartphones: the end of the beginning or the beginning of the end? The smartphone market grew to about 100 million phones last quarter. The volumes grew sequentially and as a result reached a new record share of 27% of total phones shipped. The chart on the left shows how this market evolved over the last few years. I’ve added each platform’s contribution. While much of the focus will be on who had what share, the better question might be who has the better chance to beat smartphone non-consumption? Non-smart devices are still the dominant competitors. Though it’s getting easier to win against them, they still have some compelling competitive advantages. What the chart shows is that Android (and phone versions of iOS) have taken share from direct competitors but have taken more from non-consumption. Rather than focusing on rivalry between platforms, minds should be focused on the shape of the smartphone adoption curve. The market is largely un-penetrated and yet some argue that “it’s too late” to enter or that “the game is over” and winners have already been decided. This is an argument that we are at the beginning of the end. Once the market is predictable it’s discountable. Once it’s discountable it becomes economically uninteresting. I’ve argued that this is far from certain. In a short span of a few years, a decades old business has been re-defined. But that was just the device side of a larger business. Smartphones have been, so far, sustaining to the telcos who capture the vast majority of revenues and are thus the true incumbents. If and how they will be affected by further evolution of smart devices and new business models around them remains to be determined. The challenge with any performance metrics is that there is no single measure of business performance which is conclusive. The last few posts have covered mobile phone vendor performance measured by various methods. Growth (sequential, yearly and compounded multi-year), margins, shares (units, profit and sales), rankings and time series. I’ve distinguished between smartphone pure plays and the diversified. Each is trying to shed light on what is a multi-dimensional puzzle. I’ve used various charting tools and visualizations and they each render some clues, but the following chart is one of my favorites. It shows the way operating profit was distributed among the top vendors. 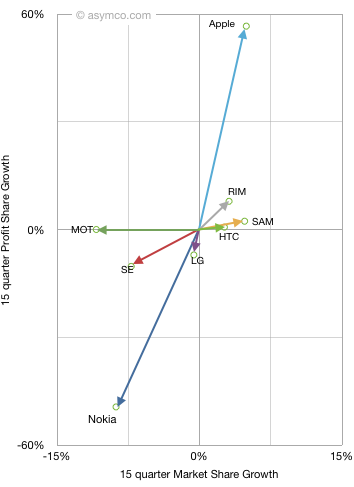 The areas each represent the profit from mobile phone sales in Q1. The horizontal axis shows the volume of units and the vertical the profit per unit. It thus shows how “efficiently” profits were captured a unit basis. It also shows at a glance the different strategies employed and how they reflect performance. It shows who made money and who didn’t. It shows the magnitude of differences. The shape of this chart has not changed in the last few quarters but it prompts speculation on how it might change in the following few years. I struggled to find a catchy name for this type of chart but @JustinD put it well here. Rawr indeed.